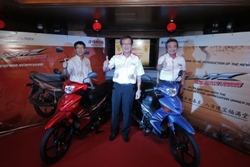 Kuching, 10 February 2015 – Hong Leong Yamaha Motor Sdn. Bhd. 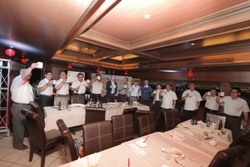 (HLYM) celebrated their Chinese New Year Dealers’ Appreciation Dinner with the introduction of the new Yamaha E115M model. The E115M is a trendy model encompassing all the features which create a memorable riding experience. 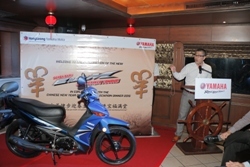 This is also the first time HLYM is introducing a new Yamaha model in East Malaysia. 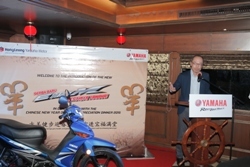 “The East Malaysian Market has always been an attractive market to us and it is of great pleasure that I present to you the E115M, which is one of the most interesting models we have had the pleasure of introducing.” said Managing Director Mr. C.H Ng at the launch of the Yamaha E115M held on the Sarawak River Cruise, Equatorial. 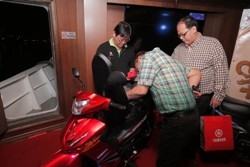 The rider-friendly E115M will take East Malaysian roads by storm with its first-class technology and aerodynamic styling which speaks volumes of Yamaha Motor’s attention to detail and the importance it places on quality first. The features of the E115M surpass expectations with its modern crystal-like front light design which makes for a classy clearer shine and aerodynamically-designed signal lights. Every feature is well-thought out to bring out the best, aesthetically as well as in functionality. Safety is also vital in the engineering of this model. The ergonomically designed handle bar was created not only for comfort but also for the safety of the pillion rider. Other key safety features include maximum lighting for the rear brake and signal lights. The stylish exhaust on the other hand, exudes a sleek design and emits smoke and sound in compliance to the European Emission Standard (Euro3). “The idea behind this model’s features is to combine both aesthetics and functionality. We want to be able to give our customers the best of both worlds. 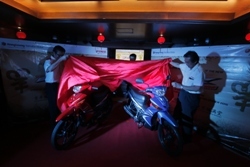 The Yamaha E115M is brought to you with the notion that design and function can marry in perfect harmony,” said Ng. Another feature of the E115M is the sizeable storage space under the seat. The attractive meter panel speaks style with its speedometer and gear position indicator layour that’s modern and striking. For easy accessibility, the seat lock is placed just below the rear light. The cast wheel, which comes standard, gives the Yamaha E115M more of an edge with a more sporty and sturdy look. The Yamaha E115M is a model that will reach out to those who are keen to ride a machine that is perfectly balanced, in every aspect. It is certainly the ideal model, based on its design and performance level. to be launched in East Malaysia.